With contributions by Kate Tindall. Iowa State University faculty members from the Department of Electrical and Computer Engineering (ECpE) and the Department of Civil, Construction and Environmental Engineering (CCEE) recently were published in Nature Communications, an open access journal that publishes high quality research from all areas of the natural sciences. ECpE and Physics Adjunct Professor Rana Biswas and ECpE Associate Professor Jaeyoun Kim joined efforts with CCEE’s Assistant Professor In Ho Cho, along with ECpE graduate student and lead author Qiang Li and 2017 ECpE graduate Akshit Peer, in the research funded in part by National Science Foundation (NSF). Their work was featured in the “Editors’ Highlights” section of the April issue under the category of “Energy Materials”; only a few published papers were chosen to be highlighted in this way. The group’s published paper is entitled, “Replica molding-based nanopatterning of tribocharge on elastomer with application to electrohydrodynamic nanolithography,” and examines tribocharging, or the buildup of charge on surfaces after they are rubbed together, commonly known as static electricity. 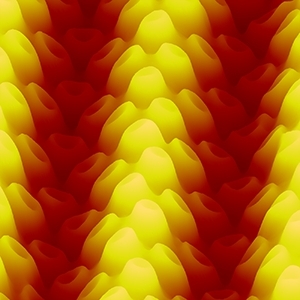 Previously, researchers assumed that charges stay on surfaces uniformly. But the research team found that tribocharges can be patterned and sculpted at nanometer dimensions, leading to nanoscale electric fields and a new handle to control nanoscale behaviors of materials and synthesize unusual structures. Careful measurements of the surface electric potential revealed that the PDMS had lower electric potential inside the nanocups with a small maxima of the electric poetical at the bottom of the nanocup (figures b and c). A specialist in structural engineering, Cho used computation mechanic simulations and fundamental structural analysis to find physical reasons for the interesting behavior of the nanoscale experiment. One of those possible future applications includes improving the efficiency of solar panels. “When you have glass windows, or solar panels that sit outside at night, dew forms on them; moisture condenses and rolls off the window or panel. It is possible that, in that action, one can create charge on the water drop and then use that to harness electricity during the night or day,” Biswas said. The team worked on this research entirely in Coover Hall, home of the ECpE department on Iowa State’s campus. To complete this research, Kim and his colleagues used knowledge that has been around since the time of the ancient Greeks. Around the year 600 B.C.E., philosopher Thales of Miletus wrote about static electricity, discovering that amber, or fossilized resin, could spark when rubbed against other surfaces. The team has been working on the project for about a year and a half, after receiving the grant from NSF four years ago. Biswas, who has previously been published in the journal Nature, also receives funding from Ames Laboratory, and Cho received funding from the CCEE department. The researchers gave their thanks to the students and former students who helped with this project. They also emphasized their appreciation for ISU’s Microelectronics Research Center and CCEE department.